Get a MusicZen license discount today. To celebrate it’s new home on the web, you can get a $2 discount towards a MusicZen License. Just enter discount code 2LDAY at checkout and you should be all set. If you are feeling good and want to spread the word about this easy-to-use utility, you can share it with your friends via your favorite social network and you will get an extra $2 off! that is $4 dollars off the regular license fee. 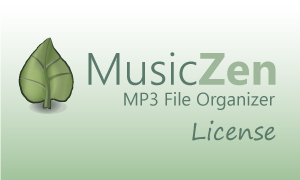 Imagine how much time you will save organizing your vast collection of mp3 files by just pointing MusicZen to your music file folder, or even if you are just looking to rename your mp3 file directories, MusicZen can help you do that with just a few clicks!.. just share it and enter 2LDAY at checkout to get the discounts.